In the early nineties I fled mean Thatcher’s Britain for Berlin, writes Jessica Jenkins. About seventeen years later than planned, I have just returned to London and am greeted by a considerable pile of post. 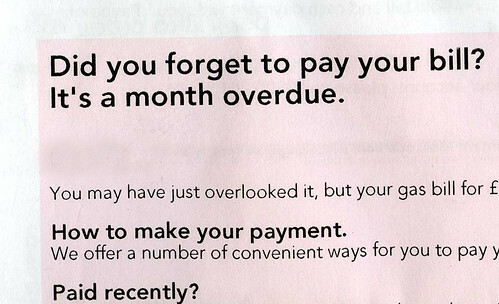 ‘Did you forget to pay your bill?’ chirrups the Head of Energy Debt Collections of British Gas, in a warm 24 point header in a reassuring roundy font. The tone is as warm as the flat is cold, and concludes, ‘We look forward to receiving your payment shortly.’ An accompanying sheet explains all of six different easy ways to part with my money, each with its own logo (I count a total of nineteen logos on the page). Forgivingly, the gas board wishes to thank me for my valued custom, by offering me a free swim. I feel unnerved. I have adjusted to a culture of correspondence which goes ‘In line with paragraph X of the You Have to Pay your Bills Law, ... see you in court’. ‘Sorry, you were out’, declares a slip from the Post Office (top). Its the oversized roundy font again, this time with jaunty little tips to show how very much on my side they are. Are they sorry I was out, sorry I had to leave the flat for the danger of the streets? In Germany saying sorry is just not done, ever since Versailles. I go out. Its not just the utilities that have become so warm and cuddly. It seems everyone is at it. Tesco offers a plastic bag illustrated with a nature scene for the sake of our children’s future. A Nescafé box amongst the litter catches my eye. ‘It’s all about you,’ it reminds me. Walking on through Brixton I pass several government agencies displaying encouraging posters. ‘Are you work shy? 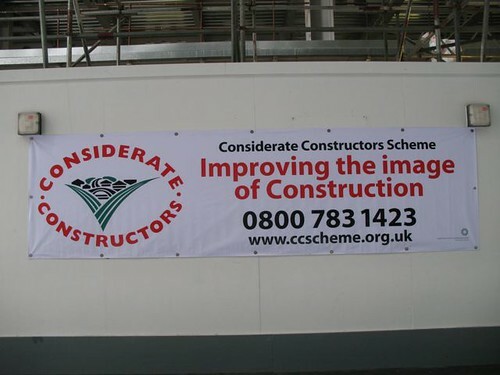 We’re here to help’. The caring monologue continues ‘Believe in Children.’ Fair play, its a Barnardos shop. But in a way that’s neither here nor there, it could just as well be the gas board or Tescos. It all just seems to be so, well, nice. Even WHSmith wants to help: ‘This apple is one of your five a day’. This one-big-family culture seems to yearn for the familiar du or tu form, and has to compensate typographically. In Germany the only authority who with whom you can get on du terms is God, and if you try it on a government employee you could be prosecuted for disrespect. Under the East German Communists, the official use of du signified ‘We are all in this together’. Or else. I’m all for being friendly but it all seems to good to be true. 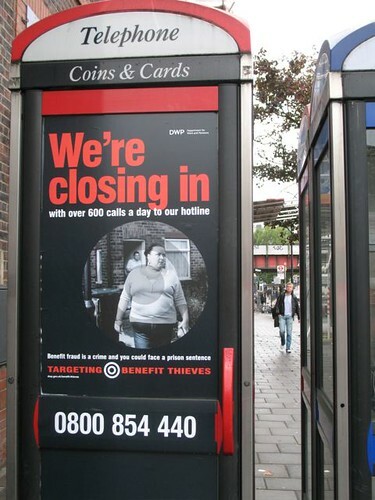 It is: ‘We are closing in’ warns a poster showing a lady apparently cheating on the benefits – now only the thief is oversized and roundy (above). It’s my government speaking again, but this time its bad cop. 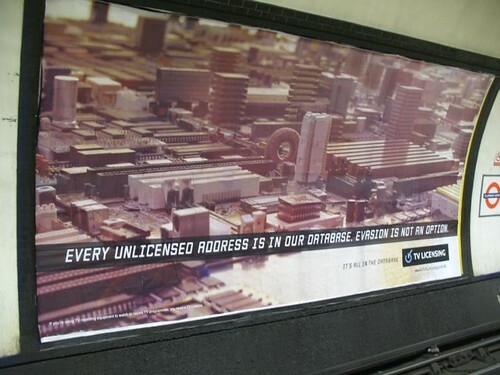 The welfare fraudster is not alone on the naughty step: ‘Every unlicensed address is on our database’ warn the TV licensing people, in a square font with a whiff of the KGB to it (below). So that’s the deal. Get out of bed in the morning, eat up your greens, pay your bills, and and you will be rewarded with a free swim and a Busy Bee nursery voucher. VAG Rounded has German origins, and it was Erik Spiekermann who started curling the sans serif, but though it may secretly love to, German communication can’t bring itself to be so familiar. Wolff Olins’s Tate Modern branding, an iconically New Labour exercise, was doubtless a catalyst for this British fondness of the soft edge. The banks have of course been the greatest accomplices, keeping a generation of designers in work. Mortgage deals were beginning to look like party invites, and what a party! You can follow Jessica Jenkins on Twitter.